The latest news from the world of film with Francine Stock. Bradley Cooper on Silver Linings Playbook, Beau Bridges on Hal Ashby, and Chris Laverty on fashion in film. 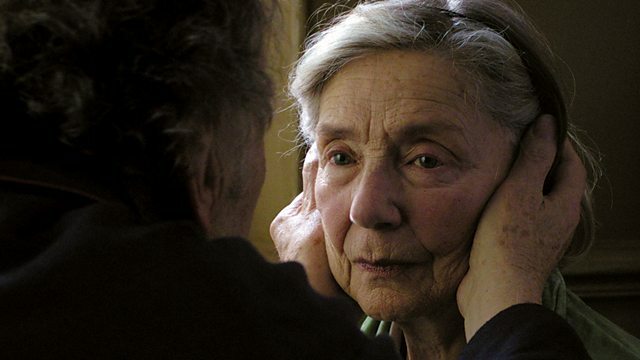 Francine Stock and guests look at Michael Haneke's latest, Amour, starring Jean-Louis Trintignant and Emmanuelle Riva who face the end together in their Paris apartment. Is Haneke the greatest living European filmmaker? Dr Catherine Wheatley and critic Jonathan Romney consider. Bradley Cooper discusses his dance around disruptive personality disorders in the romcom Silver Linings Playbook. Fashion journalist Chris Laverty pulls apart Ben Affleck's garb in Argo. And from 1970, there's romance - with more than a dash of satirical comedy - across the racial divide in a New York suburb on the verge of gentrification in Hal Ashby's The Landlord. We talk to its star, Beau Bridges.